Abigail Ogilvy Gallery is proud to present Night Swimming, an exhibition featuring Austin Eddy, Luca Molnar, Donna Moylan, Jenna Pirello, and Natalia Wróbel. Night Swimming is a selection of contemporary paintings showing a junction between abstraction and figuration. These paintings engage the viewer with their uses of geometric and organic forms, patterns, and irregularities. The works in this exhibition converge where reality meets fantasy, bringing the audience into an imaginary realm through an overwhelming sense of wonder and creativity. Austin Eddy, Three Birds, Two Clouds, One Man Caught Moving. Flashe, Acrylic, paper collage on paper 26 x 20 in. Austin Eddy, a Boston-native, is an abstract painter currently working in Brooklyn, NY. Eddy uses mixed-media elements to create vibrant and geometric assemblages that are often sculptural, but typically in the form of a painting. Eddy’s works on paper break down forms into basic geometry. Triangles, squares, and circles make up the figures’ bodies. What appears to be a repeated pattern or color field turns into the neck of a bird, the hull of a boat, or man’s hat in motion. Eddy has focused on this simplification of form and narrative for several years through both a serious and lighthearted approach. His painting on canvas, Flying-Fingers, City-Face (Between Here and There), depicts his most recent addition of collage elements on top of the oil paint. From a distance the work appears mostly abstract, but as the viewer approaches the canvas they will find a swan, a man with a trumpet, or angels flying amongst the varying textures of oil paint. Eddy received a BFA in Painting from the School of the Art Institute of Chicago, and his work was recently exhibited at Fresh Windows Gallery in Brooklyn NY, SetUp 2018 Art Fair with Cellar Contemporary (Italy), and David Shelton Gallery in Houston, TX. Upcoming, Eddy’s work will be shown at SOCO Gallery in Charlotte, NC, Ampersand Gallery in Portland, OR, as well as Viu Gallery in Queens, New York. He recently completed the Liquitex International Residency in London. Luca Molnar, Vesuvius at home. Oil on panel. 40 x 30 in. Luca Molnar currently lives and works outside of New York in Jersey City, New Jersey. Her abstract paintings are derived from maps of places, whether real or imagined. Molnar writes, "I am drawn to patterns found in domestic spaces like bathrooms and kitchens, the center of care for the body. The inescapable duality of homes as both sites of comfort and battlegrounds of intimate violence leads me to paint contested borders, edges where disparate patterns or colors confront one another." In her painting, Vesuvius at Home, Molnar combines flat colors, vibrant patterns, and suggests a flannel cloth with the use of oil paint alone. The artist intentionally combines seemingly jarring textures and surfaces, coming together to create a surprising unity as a whole. Molnar was born in Budapest, Hungary, she received her BA from Dartmouth College and her MFA from New York University. Her artwork has been exhibited throughout the country, most recently at 80WSE Gallery in New York City. Donna Moylan’s paintings transport the viewer into a world divided between reality and fantasy. An abstracted background meets figures and landscapes presented across the foreground of her work. Upon closer inspection, a couple embraces inside a hut, a crab scurries over grass, a figure seems to be half man half animal, elements that could be missed via a quick glance. Her color choices demand an audience, either bright and bold, or dark and ominous through thinly applied paint. Moylan’s work exudes spontaneity, freeing both the artist and viewer from societal expectations. Moylan has studios in Houston and New York. She grew up in Boston where she attended Massachusetts College of Art during high school and The Museum of Fine Arts School for college on full scholarship. Moylan then left for Rome, Italy where she began her career as a professional artist. Selected collections include the Whitney Museum of Art, The Cleveland Center for the Arts, The New York Public Collection, and The Achille Maramotti Collection, Italy. Her work has been reviewed by the New York Times, Art Forum, Art in America along with many other publications as well as in Italy. Pirello received her BFA in painting and sculpture from Boston University, then went on to earn her MFA in painting from Yale University. Jenna was born in Newton, MA and grew up in the suburbs of Boston. 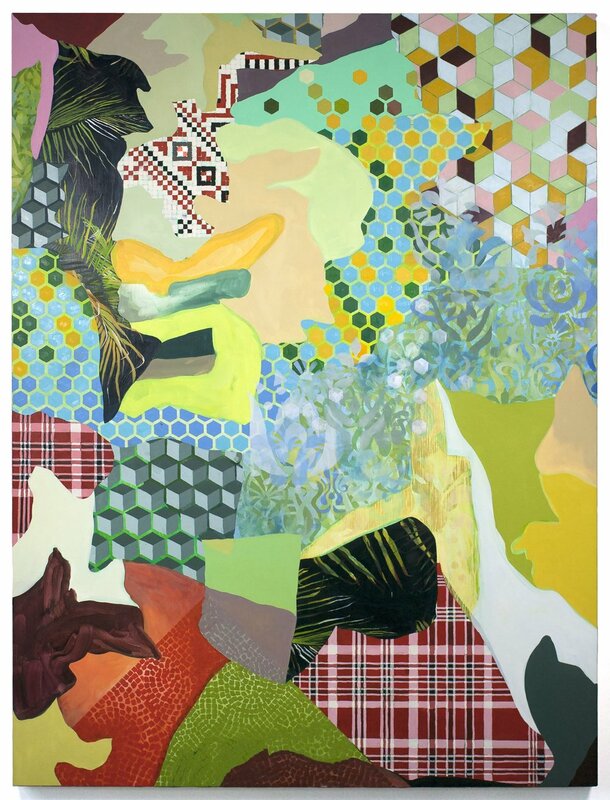 She was recently granted a Fine Arts Work Center Fellowship from Provincetown MA, where she also exhibited in a solo fellow show titled Slow Disco in 2018. Natalia Wróbel is an abstract painter currently living and working in Amsterdam. Her artwork featured in Night Swimming was completed during her artist residency this fall in Berlin, Germany at the Berlin Art Institute. 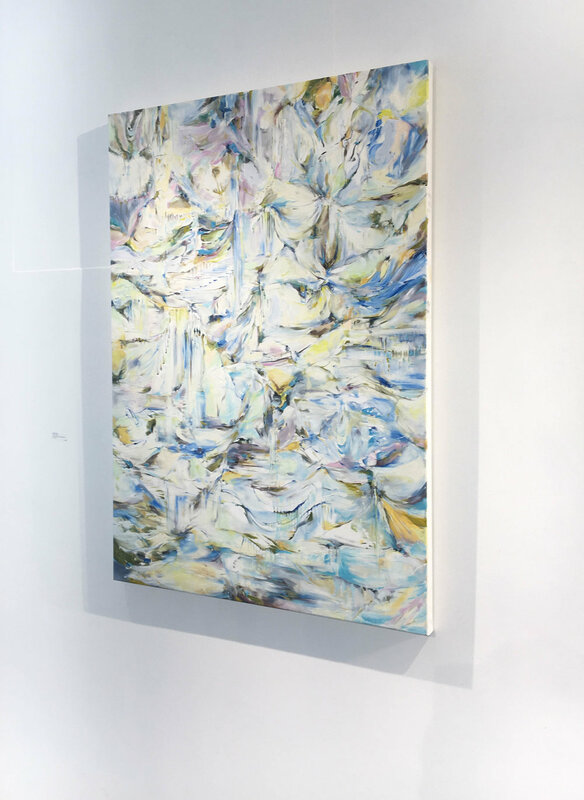 Wróbel writes, “I was inspired by cosmology, the idea of the multiverse, esoteric philosophy that acknowledges the inherent mystery around us, optical illusions, mindscape as landscape, and inversion of space.” The paintings give the viewer a sense of the unknown, as if they are peeking into a private moment shared between themselves and the artist. The artworks come from a place of self-reflection for Wróbel, in the most pure and honest way. Each piece creates a sense of overall cohesiveness, while there are hundreds of small moments created through the lines and brushstrokes to captivate an audience for hours. Natalia Wróbel Gates to Masada Oil paint and charcoal on Belgian linen 55 x 39.4 in. Wrobél studied art at Dartmouth College in New Hampshire, US, the New York Studio School, and the Lorenzo de'Medici Institute in Florence. Her paintings are featured in private collections around the world and have been on view at Art Fairs including Art Basel: Miami, Art South Hampton, and Texas Contemporary. She received the New York Studio School Mercedes Matter Fellowship in 2012, and the Murray Art Prize in 2015. In 2016, her painting was selected for inclusion at the Museum of Fine Arts Boston Auction. In 2017, Wrobel completed a painting residency at the Berlin Art Institute and her work was selected for inclusion in the MassArt auction. Wrobel's work is represented by Abigail Ogilvy Gallery in Boston, MA. She currently lives and works in Amsterdam.